It wasn?t the royal honey ?moon? Canadians were expecting. Prince William?s bride had a brief skirt-lifting experience when a prairie breeze hiked her dress almost to the waist. QMI Agency?s national photographer Andre Forget was following the royal couple at Calgary?s Airport when he captured Duchess Kate?s barely-seen Marilyn Monroe moment ? far from any admiring crowd. It happened Thursday after the royal couple were flown in a military helicopter from Lake Louise, Alta., where they spent the previous night at a nearby lodge. Forget said they were walking back to the chopper on the wind-whipped tarmac for a group photo with the crew, accompanied by an Air Force officer and an aide carrying a pair of white cowboy hats presented minutes earlier by Calgary Mayor Naheed Nenshi. As her bright yellow skirt skittered, the former Catherine Elizabeth Middleton hastily reached for the hem in a bid to stall a cheeky expos?. Despite her quick efforts, the wayward wind revealed the leggy royal brunette was wearing a thong beneath her frock. It wasn?t until after he sent editors other digital photos of the royal couple?s second-last day in Canada that Forget realized he?d captured two skirt-raising images with his digital camera. Similar photos from other news agencies are now circling the globe. ?When you?re shooting, you don?t even know you have a picture, because your camera?s interior mirror goes up,? Forget said Friday. ?After I sent other photos, I looked at the images again and there was Kate showing almost all,? he said. ?It all happened within two or three seconds, when the wind exposed her derriere.? Kate and William later wore similar cowboy hats Friday while opening the Calgary Stampede, and he had one on while delivering his final speech in the province where his great-uncle, who as King Edward VIII abdicated in 1936 to marry his sweetheart, once owned a ranch. An estimated 450,000 people lined the 4.5-km parade route ? almost double the normal turnout for the annual event. Before returning to Calgary?s airport and a flight to Los Angeles, Queen Elizabeth II?s grandson said he and his wife plan to return and enjoy more of ?this beautiful country.? Forget photographed their last day, too, sensing Duchess Katherine ?was much more attentive to her skirt,? a longer wraparound red dress than the lightweight yellow one that revealed much more than an inch of royal ankle the previous day. The newlyweds captured the hearts of millions of Canadians during their hectic nine-day tour that included Ottawa, Quebec, Prince Edward Island, the Northwest Territories and Alberta. 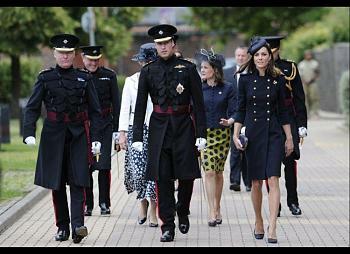 It would seem that although Will has the military training, it?s Kate that likes to go commando. Canada > Royal honey ?moon? Haha that first picture raised some eyebrows (etc) up here. I'm not for or against the monarchy, to me it's just a circus act. Darn Blucher....and you wonder why you are receiving kudos? Yup. Great pics of our little princess. Nice to see she's not staid, eh? I think she's an absolute doll. Classic beauty & bone structure. 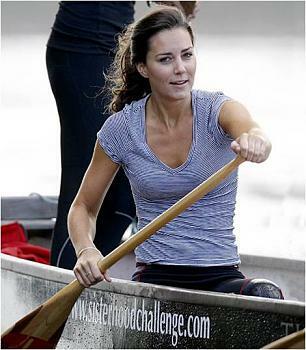 Poor Will is balding fast and Harry has his pop's ears so it's good to see Kate & Diana improving the DNA.